Hi to all of The 36th Avenue fans. This is Melanie again, from Artzy Creations. Can you believe Christmas is just right around the corner? I know I can’t hardly believe it myself. Well, with the holidays coming up, it’s the time of year to keep the kiddos busy with lots of fun kid activities. To keep my daughters busy, I like to have lots of coloring sheets and construction paper around to encourage lots of creativity. 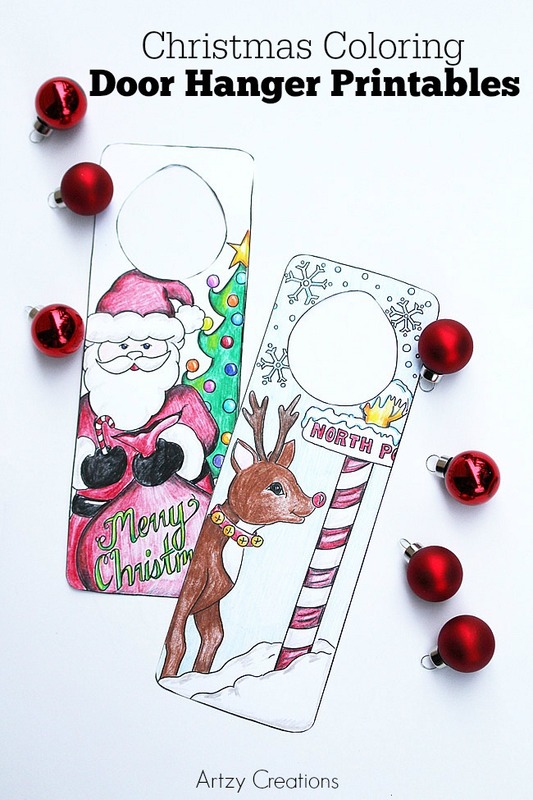 Being an art teacher, there certainly isn’t a shortage of that in our house, but this year, I wanted to create some fun Christmas Coloring Door Hangers that the kids could personalize themselves. DO NOT COPY, SAVE, OR PASTE THIS COLLAGE IMAGE! I took a poll in our house to see what my daughters wanted the most for a door hanger. Well, wouldn’t you know it, Santa was on top for sure followed closely by Rudolph and Frosty. Since Santa and Rudolph were pretty much a tie, I designed a door hanger for each. I printed these out on a card stock paper and they turned out perfectly using my ink jet printer. The card stock makes it nice too because it will withstand some wear and tear over the holidays. You can use crayons, colored pencils, or markers to color these in. Your kids will enjoy coloring this fun holiday activity and it should keep them busy for a bit too… especially if you happened to be house bound due to snow!!! 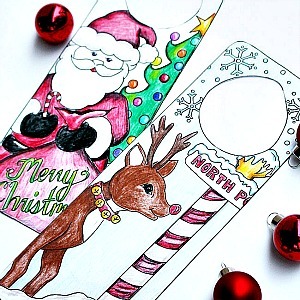 DOWNLOAD YOUR FREE CHRISTMAS COLORING DOOR HANGER PRINTABLES HERE! I hope you and your kids have lots of fun with the door hanger printables. Merry Christmas and Happy Holidays. See you in 2016! Facebook, Instagram, Pinterest,Twitter, and Google +.